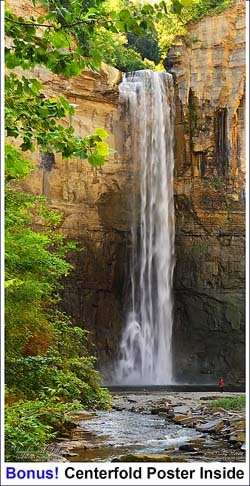 Waterfalls are an amazing sight and are a calming inspiration. The Finger Lakes region of New York State is home to some of the world's most charming and beautiful waterfalls: many of them easily accessible from main highways while others are hidden away where only a good map or guide will get you there. Calendar is produced entirely in New York State, printed by Cayuga Press of Cortland. In addition to online, this calendar is available at many Barnes & Noble in upstate New York, and on over 150 locations: gift stores, wineries, grocery and pharmacies, ice cream shops and souvenir shops throughout the Finger Lakes. Secure PayPal online ordering is available. Quantity discounts are available. For bulk quantities of more than 10 calendars, please contact Dewey either by email or phone for pricing. Thank you for your interest in the 2019 Waterfalls of the Finger Lakes Calendar.